Our speaker was the lovely Alan Samson from Orion Books. His talk was very interesting, and my favourite quote? “The book belongs to the author. An editor should be invisible.” which was said by Max Perkins, who is considered to be one of the greatest, if not the greatest literary editor ever. So now I’ve got that out the way, what have I been up to? Then after breakfast it was a talk from Rebecca Woodhead which was all about E Publishing. Fascinating stuff, in which she told us the secrets of her success, one of which is about building your “tribe” lol. What that actually means is that you need to build up your loyal following. After a break for tea it was “Ask the E Panel”. 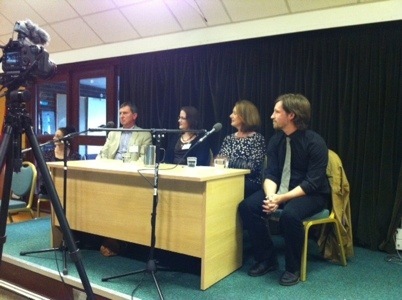 A Q and A session with Alan Samson, Rebecca Woodhead, Jan Davison and Jonathan Telfer (both from Writing Magazine). We had the afternoon off, so I spent it catching up with online stuff, reading my book and doing some writing. 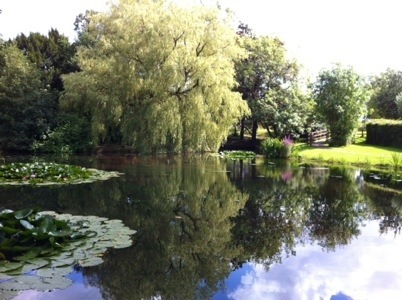 I had a wander around the beautiful Lakes in the sunshine and actually managed to find a bench in the shade. 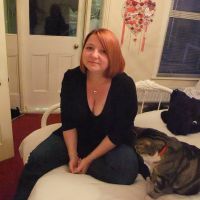 This entry was tagged Mills & Boon, Publishing, Sharon Kendrick, Simon Hall, Swanwick, WIP, Writer, Writing. Bookmark the permalink. Good luck honey, we’re willing you on! Thanks for sharing your days, its been fascinating following you. Thanks for the tips, it sounds great! What a beaitiful setting too. I wonder what Max Perkins thinks about the before and after on Raymond Carver’s works? I’m not sure about the self publishing yet. My first port of call is to try do a quality novel, then go from there. I am going to epublish one of my novels but that’s not because I think doing so is likely to get me a traditional publishing deal. Do you mind me asking you why you’ve decided to go down the EPublishing route? Cool! Someone got a pic. Mind if I put that on my main site? (join-rebecca.com). I’ll credit you of course. Thanks for the mention. 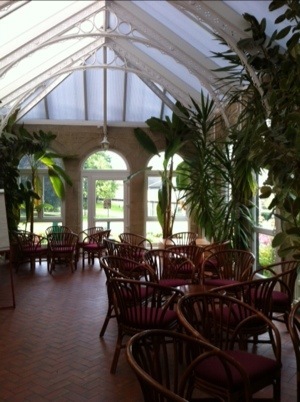 I had a fabulous time at Swanwick. What a wonderful group of people. Thanks again for the mention. Of course, yes, by all means use the pic! Reading over this post just gives me that feeling like I want to point at something across the room and ask: Did you see when…? To answer your question: I don’t think I’ll be doing the so-called easy self-publishing thing. That’s fair enough honey, do you mind me asking why? In many cases that I’ve read, self-publishing usually results in the author spending the full amount to publish the piece, and then more on top of the thousands in order to advertise. Let’s face it, social media can only get anyone so far. Contracting an editor, working with artists for any cover art, and the list goes on. I’m an author; I’m interested in writing. I’ll let someone else worry about what I have no need to worry about. 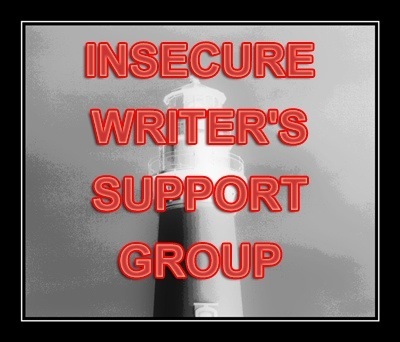 — …are my current views on the subject of self-publishing. Congratulations on finishing your manuscript. I’m sure it is a lovely piece. If you’re not ready, be sure to put on a thick skin. Once you have it zipped, buckled, and buttoned, send a copy of your MS to any and all publishers (so long as you’re able to get away with being non-exclusive), and hope for the best. I believe it’s better to tell the truth of the matter, even if the truth is likely to hurt feelings. In my experience, it’s better to hurt one’s feelings than to crush their dreams by continuously lying to them. Sounds like you’re buckling up and getting ready for a wild ride. Would love to hear more of it. — Age is nothing more than a number. It’s the wisdom that’s been gained through the course of life that tells more about a person, rather than the crazy old number called ‘age’. Best wishes. Now, C.A., old is a four letter word, well it was when it was spelt, olde. So yes, I feel ready for the journey, however bumpy the ride is. Can’t believe I’m saying this. Swanwick did me more good than I realised. And I agree, we should be truthful, but no one has the right to trample on someone else’s dreams. May yours come true.